The Marine Corps adopted a poncho for standard rain gear. This was a rubberized sheet with a neck opening in the middle and snaps along two sides. These snaps could be clicked together, forming simple sleeves. The neck opening also had snaps so it could be closed tight, preventing rain getting in. There was an extra snap so the opening could be completely closed, if used as a shelter or ground sheet. The poncho most associated with WW2 is the camouflaged version. However, before the introduction of camouflaged equipment and clothing, the Marine Corps used plain khaki ponchos. 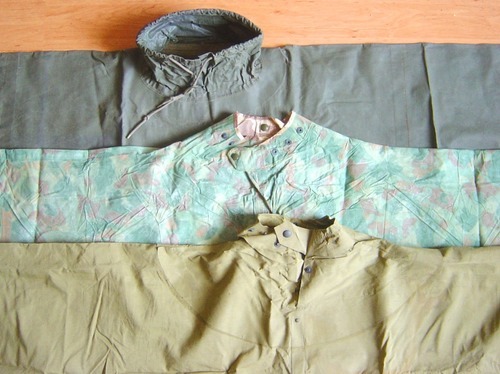 These khaki ponchos were manufactured before WW2 and were used during the Solomon campaign. 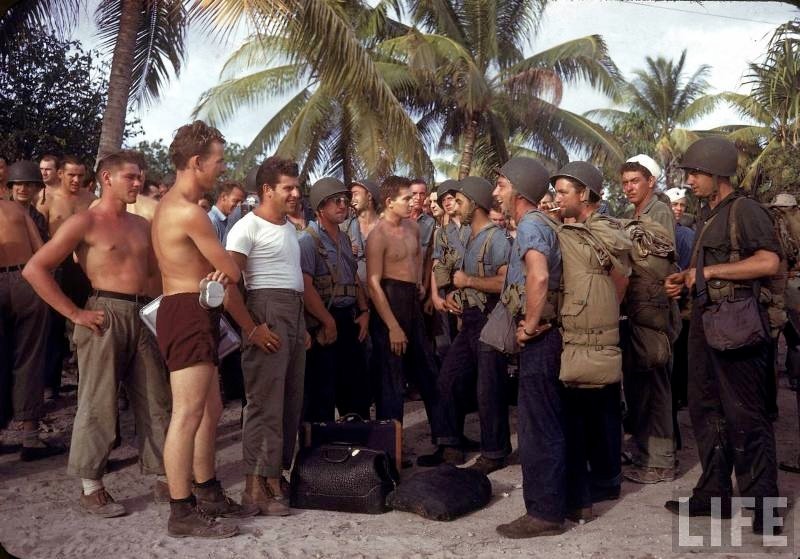 The marines who fought on Guadalcanal carried the khaki ponchos with them ashore. Some troops still used them on Bougainville. Raiders clad in the new two piece camouflage clothing can be seen, still using the khaki ponchos (and khaki shelter halves). 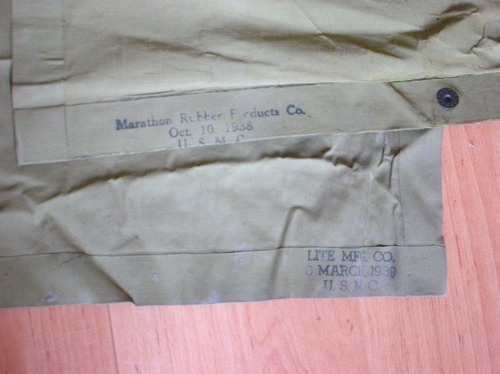 The earliest production date found on these ponchos is of October 10, 1938. It was of glued construction with the neck opening in a circular patch. There’s a reinforcement rivet below the closure. Even before the first offensive actions undertaken by the Corps in August 1942, the development of camouflaged equipment and clothing was approved. A camouflaged version of the poncho was accepted as early as July 10, 1942. 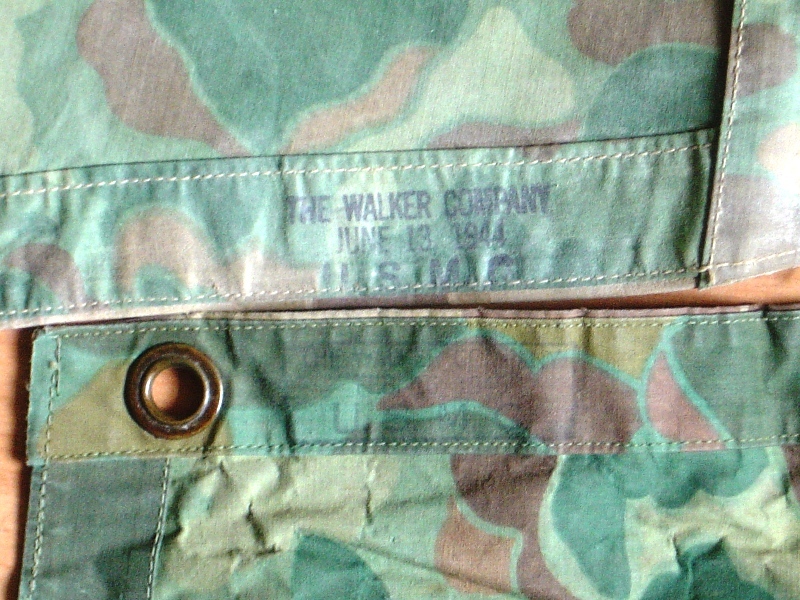 This poncho was reversible with a “green” side for jungle environment and a “brown” side for beach or desert operations. The seams were stitched and sealed with glue. The neck opening could be closed from either sides since there was a closing tab on both side. 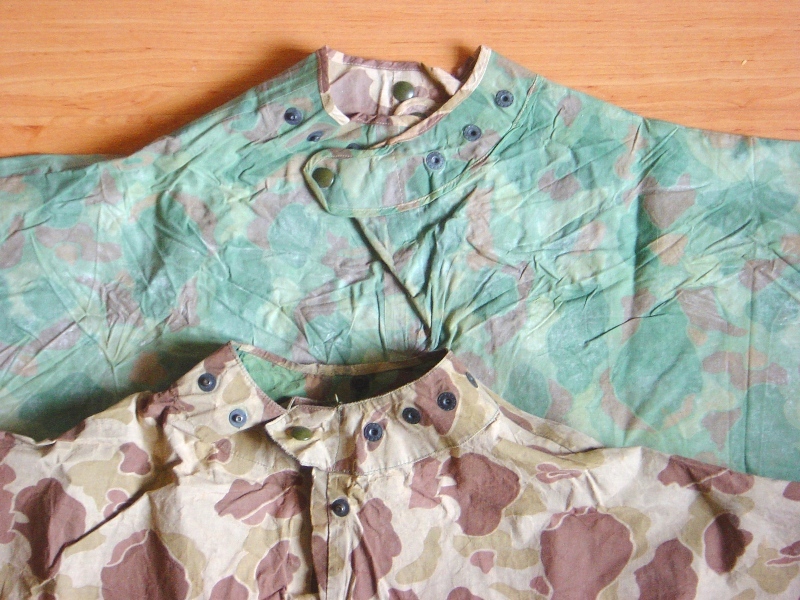 These new camouflaged ponchos were first used in the Bougainville fight and were standard issue from then throughout the war. And still in use during the Korean War. Late 1944 the ponchos were manufactured with eight grommets, one at each corner and one in the middle of each edge. The one pictured is of February 16,1945. The U.S. Navy accepted this new design for use with shore parties and CB’s. These ponchos were made under Navy contracts and were stamped “USN” and the corresponding contract number. 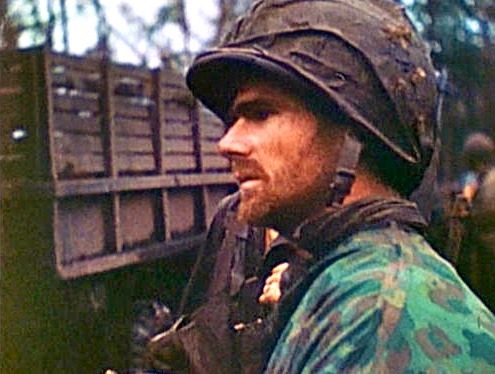 As with the M1941 pack system, the U.S. Army copied the idea and adopted the poncho later in the war as an all purpose rain gear. The army version was of a plain olive drab color and had a simple turtle neck with a drawstring closure. Finally a great picture taken for the Life Magazine, showing Navy personnel clad in dungarees. These men are using army equipment, but, secured under the flaps of the haversacks are camouflaged ponchos, folded brown side out. No doubt that these are Navy contract ponchos.